Warning: This post may make me appear far less the seasoned traveler than people may think. While I’ve traveled extensively across North America, my foreign “exploits” (sans Canada) are still rather limited. I’m working on changing that as I add experiences in new countries every year to my travelogue. This summer, that new country was Costa Rica. While I’ve been in developing nations before (in fact the International Monetary Fund considers at least 155 countries to be “developing” economies, which lumps about 75% of the world into “second world/third world” countries – depending on how you define that already loosely-defined categorization), namely Dominican Republic and Chile, I’ve never really experienced a typical town or city in a developing country. My Chilean “experience” was in Hanga Roa on remote Easter Island, that – while having similarities – was hardly typical of a South American town. In the Dominican, we stayed at a resort in Punta Cana and only caught a glimpse of where the locals live as our taxi drove by. Breeah orders us up a smoothie! Staying in the Manuel Antonio National Park area of Costa Rica was almost akin to being in, say, Hawai’i. There is enough American English being spoken about that if you come armed with just “Hola” and “Gracias”, you’re good to go. Yes, you can be as dumb a tourist as you want to be, nobody really cares. Everyone is happy to pretend being part of a little slice of America, and, hey, I’m not going to complain about it. This just makes traveling through places like Manuel Antonio less of a challenge, and sometimes I don’t wan’t a challenge, I just want to relax. 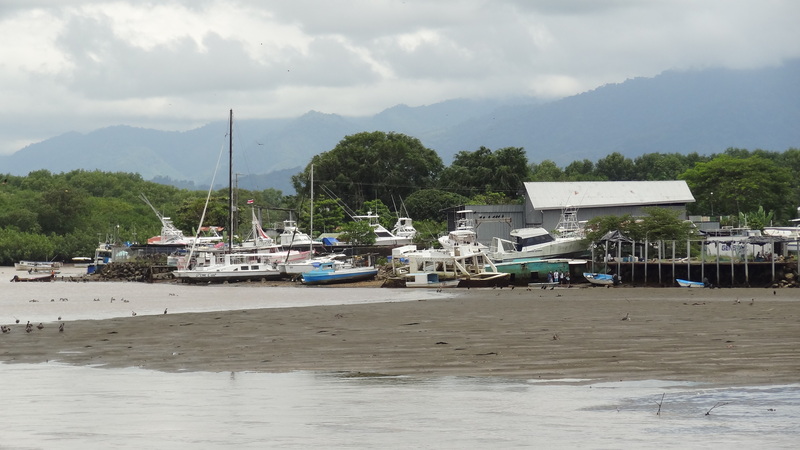 We decided, though, to take the bus all the way into town – the town of Quepos. 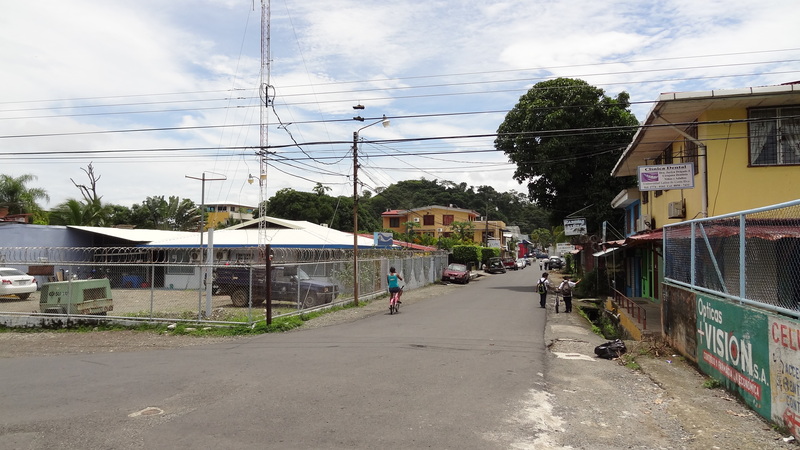 Quepos is like a “feeder” town into Manuel Antonio, it has some support structure (i.e. 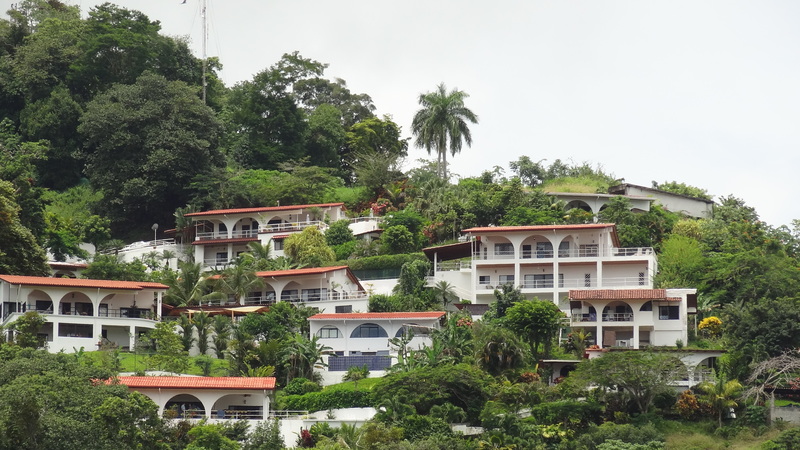 hotels, restaurants, transport) but is too far from Manuel Antonio for the walker (and we were walkers on this trip). Quepos is a visual jolt for the uninitiated. Trust me, both Breeah and I were quite uninitiated. Don’t get me wrong – the town is pretty in its own right and far more colorful in many ways than towns back home in the U.S. But it’s amazing to see how some people have to live and get by. I know it’s much, much worse in places in the world, but I also know how lucky I have it. 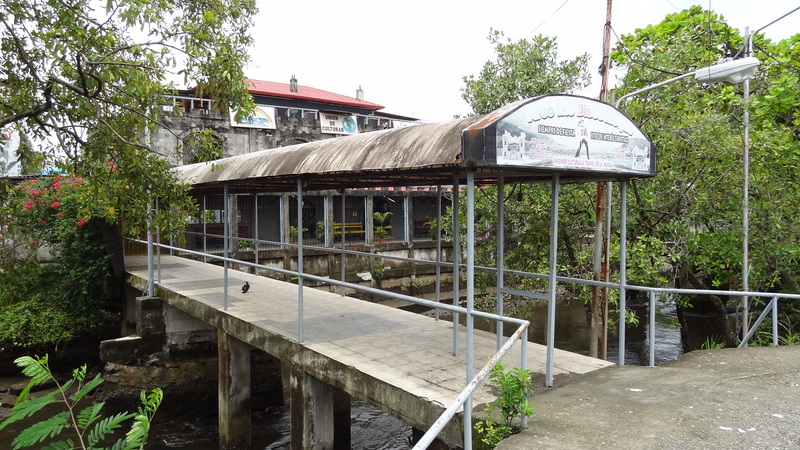 I don’t doubt the people of Quepos and Costa Rica are happy in general but as we walked through a few neighborhood streets and an alley way in this small town, I wondered how in the heck they do it. In one “open” home we could look right into the whole house, where a child was helping his mother sweep the concrete floor. Me by the local soccer field, which was next to the school. 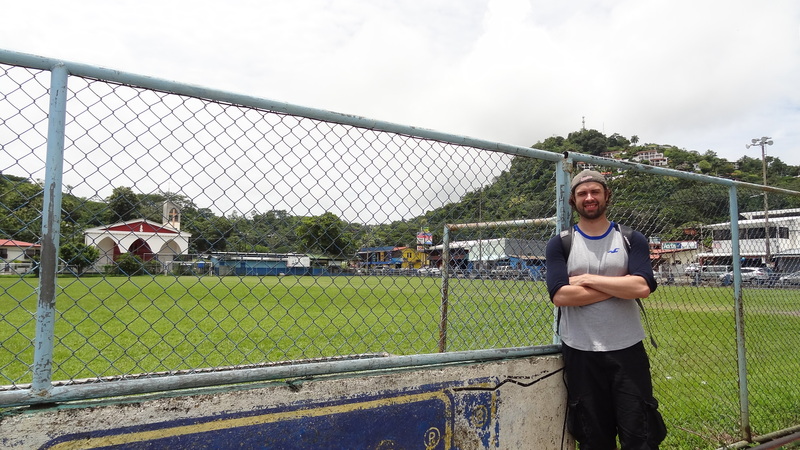 Quepos does have a soccer team in the Costa Rican leagues, but it’s down in the lower levels of the league pyramid. The downtown area is relatively bustling, but with few tourists. In fact I spotted barely any fair-skinned people outside of us. 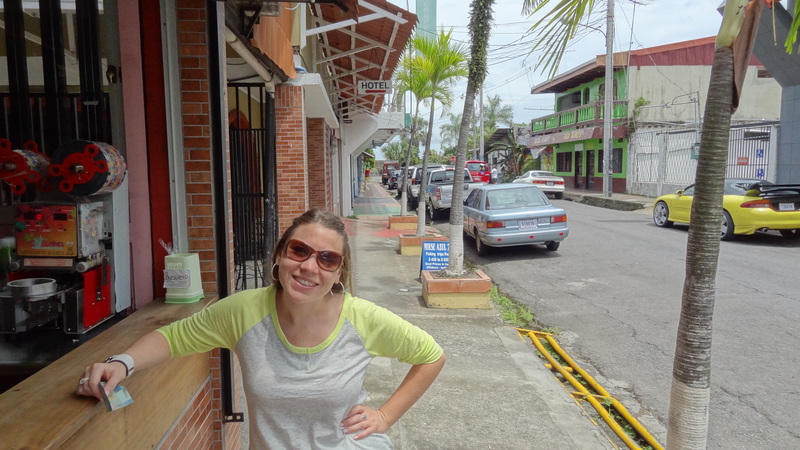 I didn’t feel so much out-of-place, I assumed the locals are quite familiar with “gringos” already. I actually felt really comfortable, which, for someone so used to traveling in and around his own country, I’m somewhat surprised I did. I think a lot of people go to places like this, see the relative poverty, feel like they stick out as “rich” tourists and get their guard way up. Not that it’s not good to take precautions, and their are many countries where you REALLY should watch your back, but that goes for the U.S. as well. I find the dangers of traveling to often be over-exaggerated by people who go into it unprepared. Breeah and I just went about our way, exploring the nooks and crannies of this place, eyeing the small food stands and restaurants and selecting a few goodies at the local bakery. We bought a smoothie, walked near the docks, strolled over to the school and the football field, took in the church and watched the kids spending their siesta of sorts scampering about the public playground. Still, and I think this is a natural feeling, I compared the lives of these people to mine. I looked up basic salaries in Costa Rica and was shocked to find that the few pulling in 15-20K a year are generally quite well off relative to the rest of the population. I wondered how many could even live the life I live – which is quite modest, really, despite my travel plans (believe me, I budget like a madman to make some of these trips a reality). Do these people ever leave Quepos? Do they ever see what else is out there? Do they want to? Are they happy and content? I realize my life and goals differ from that of others all over the world, including the U.S., but I can’t help but compare to what I know life to be. I feel somewhat guilty doing this and I also feel a sense of pity for the people I see here in Quepos – but should I? They look like you and me, they don’t appear any more angry or sad than you and me, and they were only kind, helpful or, at worst, unobtrusive. The local culture center also straddles the ditch. It’s one of the most unique buildings in town. Interesting post, Phil. My own previous international travel had all been North America and western Europe prior to this year. I, too, had my eyes opened a bit when I traveled to South Africa. Around the Cape Town region, nice middle-class and swanky neighborhoods are within shouting distance of townships with apparent abject poverty in the crowded clusters of tin shacks. One of the larger townships we drove by is estimated to hold 500,000 people, with train and bus stops inside a vast sea of corrugated tin. We were warned away from the townships and told that one shouldn’t stop a rental car on the road near the townships. Yet the people I spoke with who likely lived in them were warm, laughing, and generous to confused tourists. 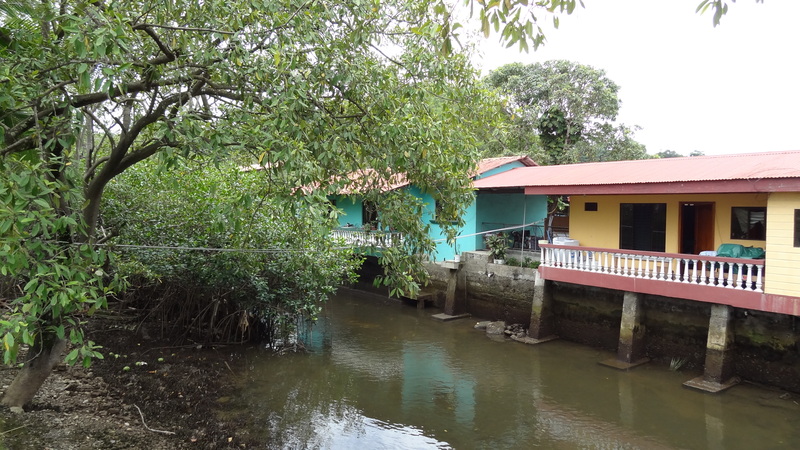 There are guided tours that travelers can take into the townships. This provides employment and income to township dwellers, but I couldn’t get past my feeling that it was sordid and exploitative for the relatively rich Americans to come look at people living in poverty much as we came to look at the animals in the wild – and that’s before you add in the racial aspects.These townships all were near a large city, though. We found more of a mixed bag of impressions in more rural areas – a bit of wary regard and a bit of pleasant welcome. All you can do anywhere is try to be sensitive to the vibes and respect them. I completely agree with you – travel isn’t only seeing the sights; it’s meeting the people who make the place come alive. Thanks for your great comment Dee Ann. I’ve heard about the townships in and around Johannesburg (Alexandra is particularly famous and I believe provided the backdrop of the sci-fi movie District 9). I was aware there was some of that in Cape Town – but not to the extent you mentioned. South Africa reminds me a lot of Brazil in that there is a huge gap between the have’s and have-not’s and, unfortunately (and maybe especially in South Africa’s case), that divide coincides with race as well. I’ve heard of “slum tours”, especially in India after the success of Slumdog Millionaire, but I’m with you – that just feels wrong to partake in.